Customers dine at Congdon's After Dark food truck park in Wells in this York County Coast Star file photo. 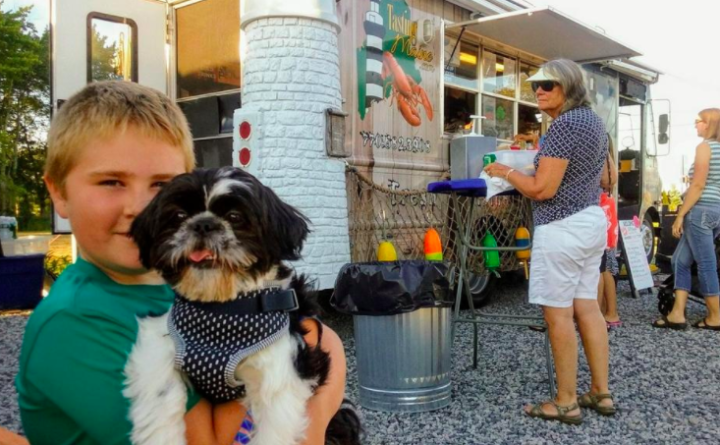 WELLS, Maine — Calling all foodies, craft beer fans, seafood lovers, fresh-doughnut freaks, hungry, sand-covered beach-goers and even the family hound: There’s something for everyone at the expanded Congdon’s After Dark food truck park, opening this weekend at the renowned family bakery, Congdon’s Doughnuts on Route 1 in Wells. Congdon’s After Dark launched in the summer of 2017 with three food trucks, and has been enhanced and expanded for the 2018 season with more trucks, alcohol service, expanded parking, and entertainment such as live music, classic car shows, and face painting. Food truck parks have grown in popularity across the country in recent years, but are still relatively new in many places around New England. Congdon’s owner Gary Leech said he wanted to provide a diverse dining experience that would appeal to locals and visitors alike, while creating a unique atmosphere that will appeal to families, beer enthusiasts, the service industry, and tourists of Wells and the surrounding seaside communities. It is a big change for the iconic family business that has cranked out their world-famous doughnuts at the Route 1 location since 1955, said Adam Leech, who handles the marketing and media for his father’s new venture. “It’s a big change, but it’s a fun one. It’s an an interesting expansion of who we are as Congdon’s. We’ve always been very family-friendly and inclusive, and people love that. We think we’ve accomplished that here with Congdon’s After Dark, too,” he said. Fourteen food trucks will be in rotation, with a variety of cuisine for every palate. Cuisines include seafood, Mexican, burgers, Italian, Southern, steak and cheese, gourmet french fries, Middle Eastern, farm-to-table, gelato, doughnuts, ice cream and more. The park website, cadfoodtruck.com, includes a schedule so the public can see which trucks will be available each evening. Participating trucks include the legendary Hoss & Mary’s Grub Shack, a former Old Orchard Beach mainstay that was featured on Food Network for its creative, outlandish burgers. Leech said the Hoss & Mary’s truck will roll into Wells sometime in mid-June, after returning to Maine from Florida. Other trucks include Tasting Maine (North Berwick), What-A-Wrap (Kennebunk), Knew Potato Caboose (Nottingham, New Hampshire), Gorgeous Gelato (Portland), Farm-to-Coast Mobile Kitchen (Portland), El Camino Fresh Mexican Grill (East Waterboro), Chef Koz’s Crescent City Kitchen (Farmington, New Hampshire), The Truffle Truck (Portland), Falafel Mafia (Portland), Fishin’ Ships (Portland) and Arundel Ice Cream (Arundel). The Congdon’s food truck has been renamed Big Grampa’s Grill after Richard Leech, who lives next door with grandma Eleanora and is always wandering around, according to his grandson. Big Grampa’s Grill will feature a variety of steak and cheese subs and a veggie burger substitute. There will be plenty of vegan and gluten-free options at the various food trucks for those with dietary restrictions and preferences. “We really worked hard at vetting this list and getting a variety of trucks,” Adam Leech said. Seven of the trucks will be there every day, with three additional rotating spots. For those craving a really late-night snack, a Congdon’s truck will serve fresh doughnuts right out of the oven as they are being made for the next morning. “In a few weeks, we’ll be bringing out warm doughnuts for a late-night treat. We think it’s a neat way to give people that super-fresh doughnut they’re craving,” Leech said. Craving doughnuts and beer? You’re in luck. The beer garden will feature beers from some of Maine’s best breweries, including two made with Congdon’s doughnuts. On tap all summer will be the Honey Dipped Blonde Ale, a smooth, summery beer made by Saco-based Barreled Souls Brewery using Congdon’s famous honey-dipped doughnuts. “It’s a bright golden brew, it’s the same color as the doughnut, and it tastes just like it. It’s really easy to drink. We think it’s pretty tasty,” Leech said. Another collaboration with Barreled Souls, the Maple Bacon Fritter Stout, will be available in cans at the beer garden later in the season. While the beer garden will include some classic brews and offer wine and mixed drinks, the focus will be on Maine’s buzzing craft beer industry, according to Leech. Congdon’s After Dark operates from 4 p.m. to as late as 2 a.m. The park will be open Thursday to Sunday until late June, then open daily for the summer. There is no cost for admission and free parking is available on site. Congdon’s also has a stop for the trolley that operates in Wells and Ogunquit during the summer.